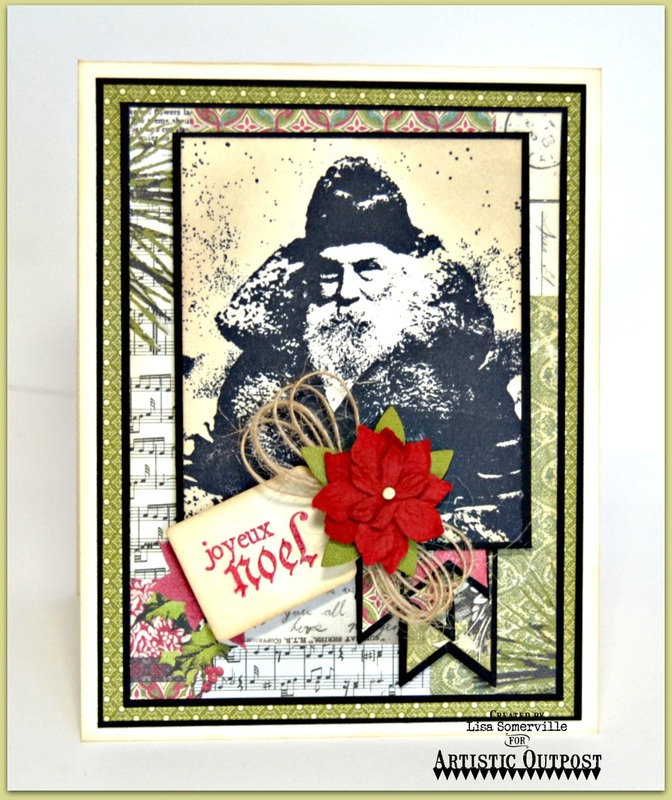 My card today uses one of my favorite sets from Artistic Outpost, Snowy Woods! I stamped the the image in Black Archival on Vanilla card stock, and sponged the edges with Ranger Antique Linen Distress Ink. Red Ink and I have a "love/hate" relationship, so I stamped the sentiment in Red on vanilla card stock, clear embossed and die cut the panel using the smallest tag from the ODBD Custom Recipe Card and Tags Die, then sponged the edges with Antique Linen Distress Ink. I used the ODBD Custom Pennants Die, to die cut the "fishtail" from pattern paper, then trimmed the die cuts to fit onto the Black die cut panel. To further embellish, I added a poinsettia flower, die cutting the leaves from the pattern paper using the smallest leaf die from the ODBD Custom Fancy Foliage Die.